New World sparrows were traditionally combined with buntings into the family Emberizidae. Recent phylogenetic analysis (Barker et al. 2013) and mitochondrial DNA (mtDNA) analysis (Klicka et al. 2014) found that the Old World buntings should be separated as a sister to New World sparrows. New World sparrows have been separated into a new family, Passerellidae. 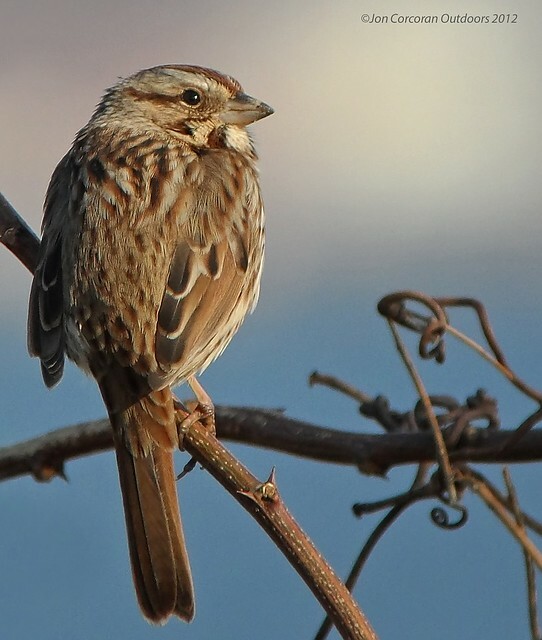 The Music of Nature proudly presents "Song Sparrow," a video portrait featuring several singing Song Sparrows, gathered in the countryside around Ithaca, New York. 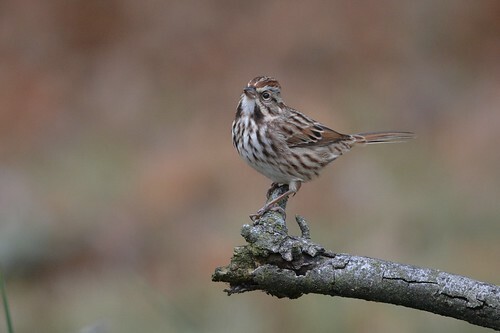 Song Sparrows are winter residents here and their bright carols are often heard on cold, clear mornings in late winter. Males continue singing well into the summer months. 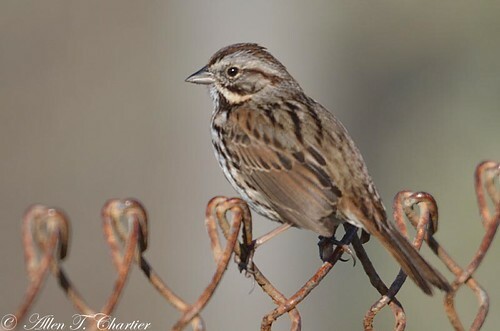 The Song Sparrow is common throughout North America; more so in the east than west. It can be found in brushy thickets, gardens, streamsides, marshes, roadsides. It has a white throat and whisker stripes on the face. The breast and side streaking converge into a large central spot. It has pink legs and feet. Its long rounded tail is pumped in flight. The song is a series of notes starting with 2-3 bright "sweet sweet sweets". It may be represented as "pres pres pres Presbyterian". A Song Sparrow singing and calling from the top of a shrub. Woods Hole, MA - May 2013. Taken with a Canon t3i and a 55-250mm lens. Singing Song Sparrows along beautiful Cliff Walk overlooking the Atlantic coast in Newport, Rhode Island. These scenes are from the first week of June. There's a narrow strip of thick vegetation on one side of the path and the cliff on the other. This prime Breeding habitat is upheld and defended by some of the best singers around. The birds seem habituated to human presence on Cliff Walk, giving a golden opportunity for close-up filming.Birds shown (eastern Song Sparrow, Melospiza melodia;Northern Cardinal, Cardinalis cardinalis; Yellow Warbler, Dendroica petechia; Gray Catbird, Dumetalla carolinensis; American Herring Gull (first summer), Larus argentatus; Double-crested Cormorant, Phalacrocorax auritus. Birds of North America playlist. I took this bird photo today at Westwood Nature Center in St Louis Park MN. The bird was singing.